People who prefer nature to New York tend to argue that the buildings block the sky. Some say that the highrises feel claustrophobic; others, that the lights shroud the stars. To them, the jigsawed cityscape is an unsolvable puzzle and a confining trap. I am not one of those people, but I understand that feeling: the sense of being cramped in darkness amid too many other people’s towers, unable to see the light and life happening even just one block away. In my first Brooklyn apartment, my bedroom had no windows. I lived with two girls whom I had met through a mutual friend, and their adjacent rooms contained the only windows in our fourth-floor Greenpoint walk-up. From bed, they looked out on the Manhattan skyline, backlit in burnt gold at sunset and washed silver at sunrise. But I awoke each morning to dark, square walls. I never knew if it was raining or if there was a breeze. Aside from gravity, I had no proof of which way was up. Somehow, that seemed to multiply the force’s magnitude. I felt heavy and constrained with my feet fixed to the floor, caged inside my unlit room. I spent most of my daylight hours in my cubicle at my grueling public relations job, and I came home every night to that dark box. It didn’t matter how many decorations I collected and pasted to the walls — posters, postcards, photographs, business cards pocketed from nearby stores and cafes I intended to eventually revisit — when I couldn’t see outside and when no one else could see in. That fourth floor might as well have been an underground pit. I was stuck in shadow, heart shackled, feet grounded, desperate to keep my head in the clouds and my daydreams lofty when life seemed to want to drag me down. With no eye on heaven from home, I had to go hunting for it. I spent all of my weekends wandering outside. I began amassing iPhone snapshots of striking buildings I passed, zooming in on strangers’ windows like small cross-sections of their apartments, collecting portraits of houses and highrises and small squares of sky. I was playing with the New York jigsaw, trying to comprehend how other people’s pieces fit together so I could see where my own dreams might squeeze in. In a city of skyscrapers, sometimes you have to search out the slices of light amidst the shadows. You have to reframe your surroundings in order to keep your spirits high. When gravity pulls you down, you have to seek the things that lift you up. For example: Attentiveness. Curiosity. Big, bold dreams and empowering goals. Conversations with friends who understand. Simple comforts. 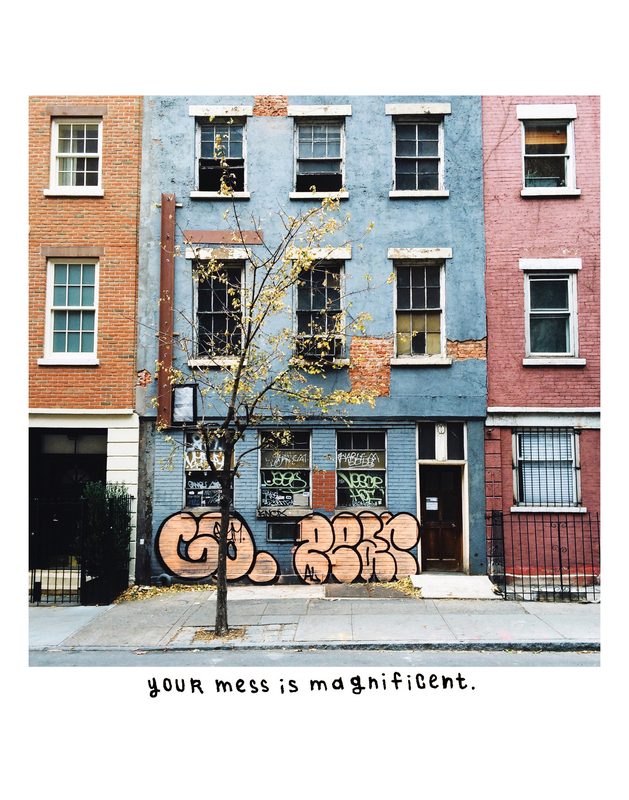 Art forms that make meaning of the mess. With open eyes and a permeable heart, the city jigsaw is riddled with opportunity and beauty. The sun seems to skip-jump-dance hopscotch across the gridded windows of opposing buildings, the glass bathed in watercolor blue. Its buttered beams melt between brick and sidewalk, the triangle-cut shadows like chocolate pie slices. The night’s twinkling gold skyscrapers become cosmos, latticed in intricate human-made constellations. There are scattered reflections of heaven every direction you look. You have to find ways to get starry-eyed with your feet still set to the sidewalk. Sometimes, it’s as simple as looking. Actually looking. And looking up, instead of simply straight ahead. I began this essay because I fell in love with its first line. We build castles in the clouds and call them skyscrapers. Those words dropped down on me when I was looking towards the sky, admiring the jigsawed buildings while waiting for a light to change. I wasn’t sure what they meant yet. I wasn’t even sure I’d sort them out when I attempted to write them into reality. Like the sky is a lottery ticket. Like we’re hoping to find hidden fortunes if we just scratch off that blue glaze. No matter how hard we scratch, most lottery cards hide nothing more than meaningless strings of numbers, and that’s okay. I think we will always covet some sort of bliss that’s just beyond our reach. We will always crave the climb. But there is power — towering power — in learning to stay grounded and dreamy at once. In living minuscule and mighty at the same time. In reflections of heaven that are rooted in reality. A simple switch in perspective is a game-changer, turning traps into vitalizing puzzles. Pick up the pieces and play.